This article is based on new unpublished research and an oral presentation given by the author at the AAPG ICE Conference in Salt Lake City on May 22nd, 2018. 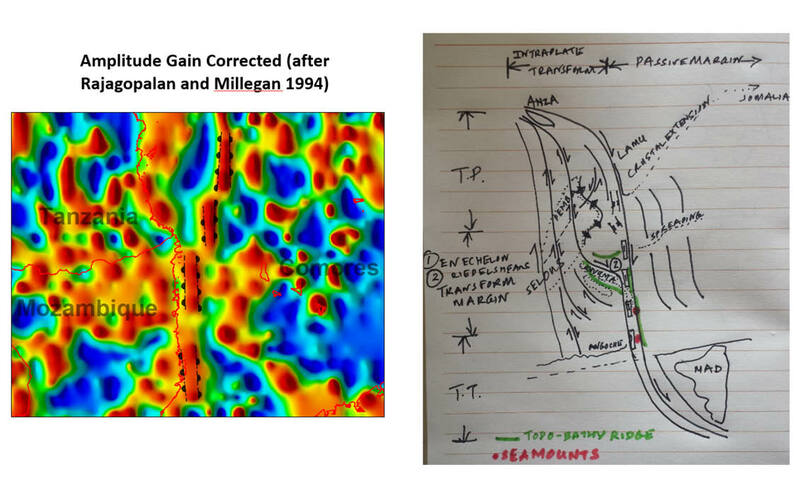 In the 1980s, research in strike slip structural geology became popular and fashionable. Since then interest has subsided, but new findings support the theories offered by Woodcock and Fischer, Storti et al and many more. Last year, while helping my three-year-old to doodle and draw wiggly lines, I had the idea of applying it to geological maps, by drawing curved fault traces on residual gravity and magnetic maps. Traditionally in gravity and magnetic interpretation we draw roughly straight lines on residual maps, since both gravity and magnetics are vector fields, and we are interested in the small displacements of the field lines that we describe as ‘anomalies’ in the total field or (residual field) measured response, rather than look at the broader picture. This is when I realized that strike slip faults can extend for thousands of kilometres, and envelop many of the typical geological structures we identify in basin exploration to define different petroleum play systems. Curved lines need not be banished to the auxiliary realm of contouring! At the time I was interested in the East African margin, working in a research group unravelling the mysterious lack of oil discoveries in the area, from Somaliland in the north, down to the large Karoo foreland basin in South Africa. These days it is commonly accepted that Madagascar has drifted south off the Kenyan and Somalian shores to its present position. Sandwell’s Free Air gravity data is widely used to interpret fracture zones and indications of lateral drift. Together with the palaeomagnetic studies of Reeves, Torsvik and others, we now have more confidence in the paleogeographic setting of pre-breakup of Gondwana. Satellite geophysical data can tell us a lot more, and is directly correlative to geological structures that identify areas of compressional and extensional deformation. The scientific principle of repeatability underlines the integrity of these structures; using many different satellite data sets, the residual anomalies and their indication of the same geological structure gives credence to their presence. 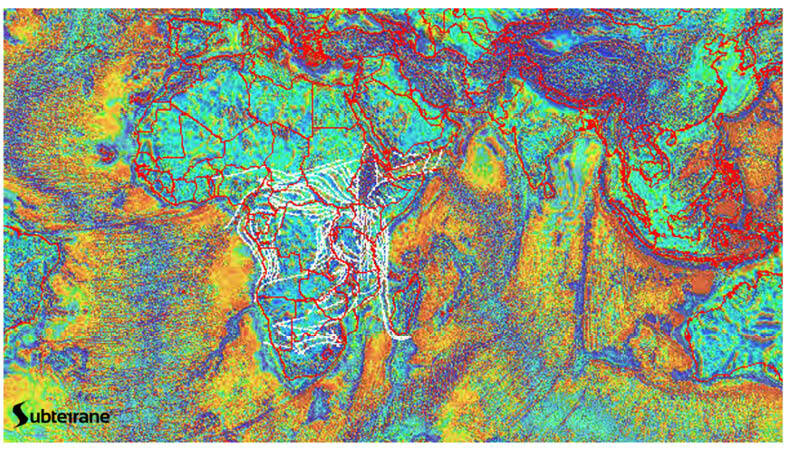 Satellite data is the only geophysical way to capture 2D long-wavelength spatial structure at high resolution. It is not possible to determine the azimuth of fault traces on regional seismic sections, but local 3D seismic give us clues as to the existence of larger fault systems at play. 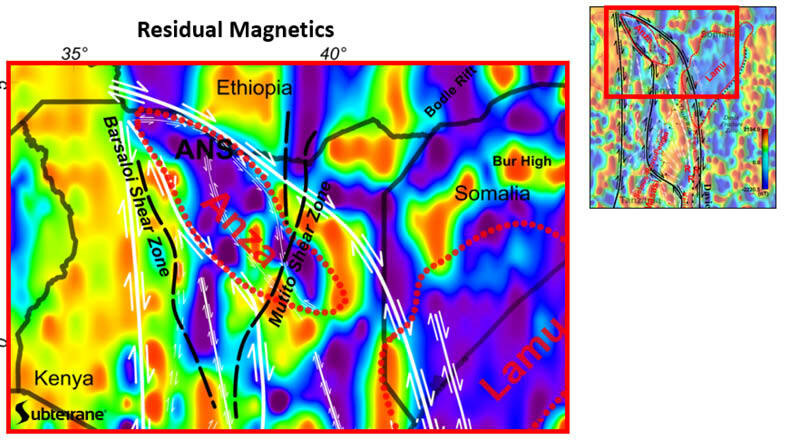 Figure 1: Present day expression of the East African intraplate strike slip system on a residual gravity base (after Long, 2017) with magnetic chron picks (purple) of oceanic spreading from Seton (2014). It is now possible to see the influence of long-range faults, and how both crustal creation at oceanic spreading centres and crustal destruction at subduction margins are controlled by their long-range imposed stress fields. Onshore, where we have relict oceanic crust (ophiolites) exposed, we can start to piece together the influence of long-lived, long-range faults on rift propagation, oceanic spreading margins and also the destructive transfer of subducting oceanic crust back to the Earth’s mantle. 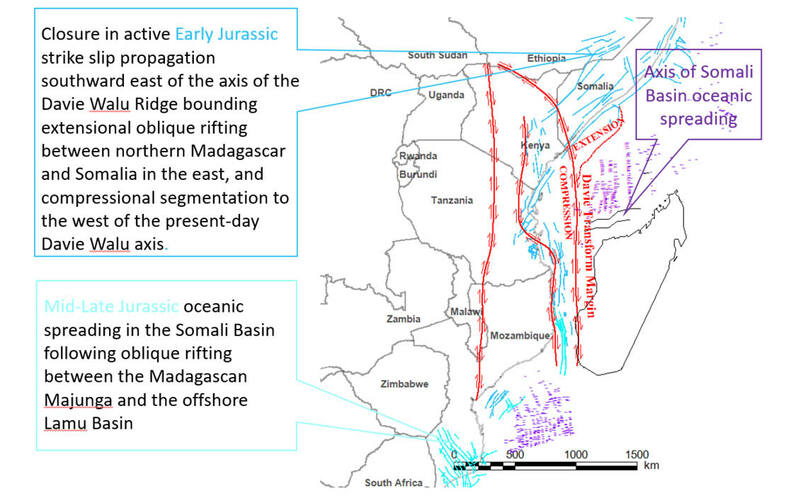 Last year I met with Colin Reeves, David Boote and Pamela Sansom from BG to talk about the Jurassic breakup of Madagascar from the East African margin, including a discussion of the transpressional structures seen in BG’s offshore Tanzanian gas fields. These structures can not exist alone without a larger regional fault system at play, according to the principles of strike slip tectonism. 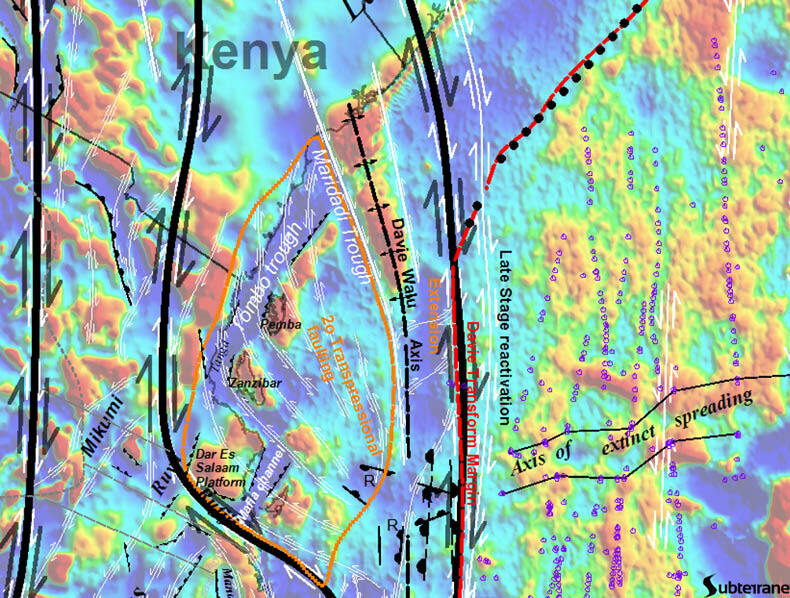 Through extensive research of published seismic and well data, geological maps, and other hints from the geophysical anomalies expressed in the satellite data, further clues to faults associated with strike slip tectonism have emerged. Then I noticed a large scale sigmoidal structure extending from the Anza basin down to the tip of Cap St Marie in southern Madagascar (Figure 1), and it got me wondering. Fritz et al. defined the onshore suture zone of Precambrian Gondwana. It underlies the Anza Basin, and there is evidence from seismic and satellite gravity and magnetic data that Anza has been rotated as the Jurassic breakup and Madagascar southern drift proceeded. Figure 2: The Anza Trough marks the northern closure of the current strike slip margin by rotation. Annotated with Fritz et al’s 2013 suture zone. In the gravity-magnetic comparison in Figure 2 we see clear evidence of related extensional deep fault offsets along the east side of the transform margin, consistent with preliminary crustal extension as the oblique rifting proceeded; this concurs with the ideas of Storti, among others. Figure 3: Reactivated present day releasing bend, where folding and synthetic sinistral strike slip faulting gives way to dextral extension east of the Davie Walu Axis. The gravity trough coincides with the magnetic trough, clearly marking the passive margin of the ocean-crust boundary east of the strike slip system. 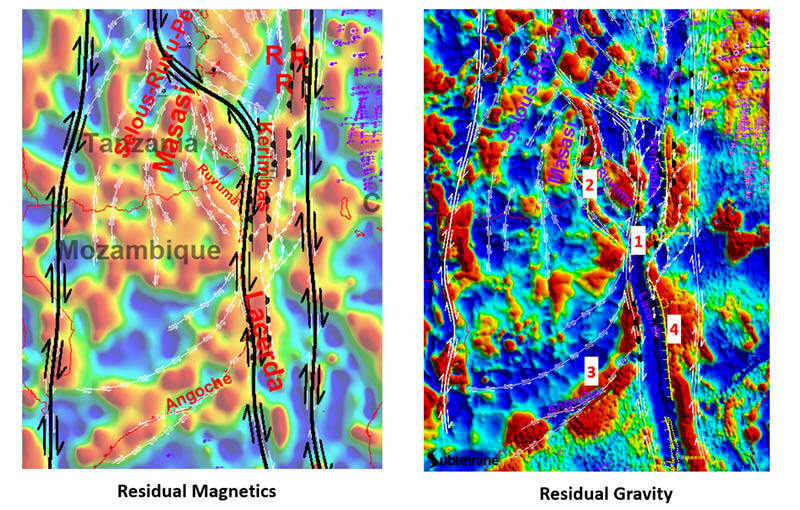 In the west the intraplate strike slip bounding fault shows correlative offsets in both the residual gravity and magnetics. Morley, 1999, suggested that earlier Karoo and Jurassic sequences may exist in the Anza Trough, hidden on seismic by a thick overlying Cretaceous sequence. To the south of the Anza Trough we can see a reworked transpressional bend that exhibits multi-phase deformation. 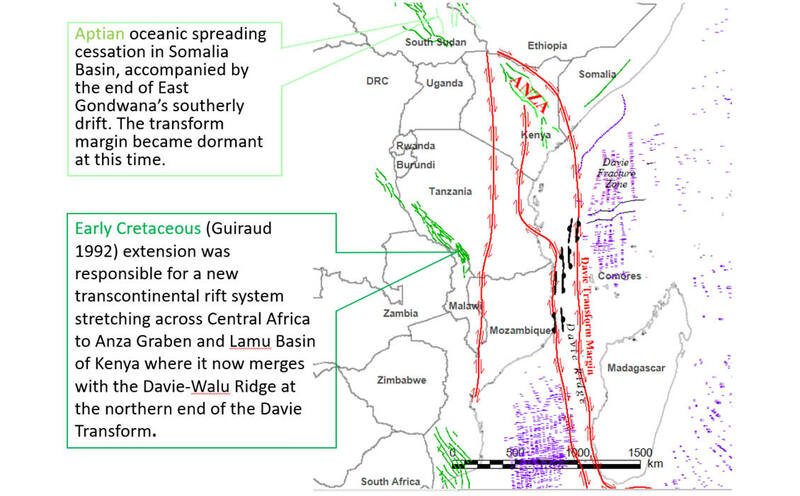 The earliest deformation would have been on breakup, as evidenced by the Dar Es Salaam Platform- Zanzibar - Pemba Island trend, which resembles a synthetic fold axis oblique to the propagating strike slip margin (Figure 3). Figure 4: Echelon magnetised crustal blocks, in a dextral strike slip setting, indicative of duplexing (e.g. Woodcock and Fischer, 1986). Figure 5: Kerimbas-Lacerda duplex to transtension. 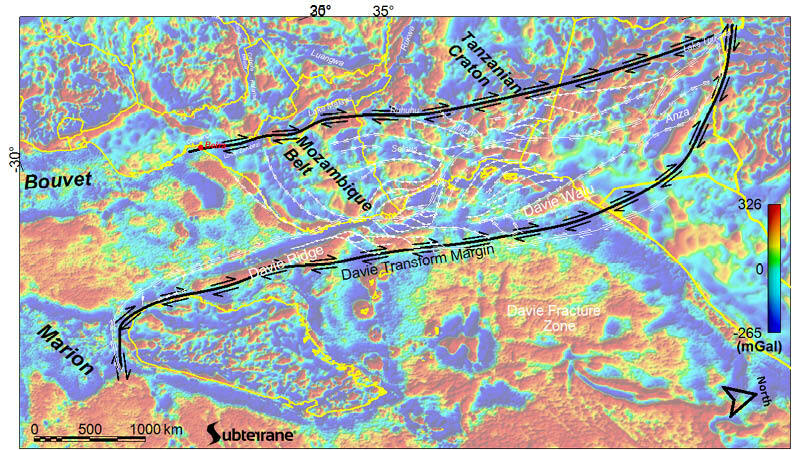 1 - Southern onset of narrow transtensional zone (Lacerda Basin); 2 - Rotation of Rovuma; 3 - Angoche pull-apart, antithetic fault zone; 4 - Offshore Tertiary uplift, bound to the east by deep basement blocks, while former bathymetric ridges (yellow lineaments) bind the Davie Ridge to east. The presence of four large magnetized deeper crustal blocks arranged en echelon further south offshore into the Indian Ocean is testament to the formation of a zone of duplexing (Figure 4). These are accompanied by shallower crustal gravity expression of en echelon rift basins, which include two northern unnamed basins and the Kerimbas and Lacerda Basins to the south (Figure 5). These are consistent with the identification of extensional duplex systems identified on seismic. Offshore northern Mozambique the enveloping strike slip fault system narrows into a transtensional zone that is coupled by the Davie Ridge and runs south, until the strike slip closes offshore southern Madagascar in active strike slip against the relict Mascarene oceanic spreading margin (Figure 6). 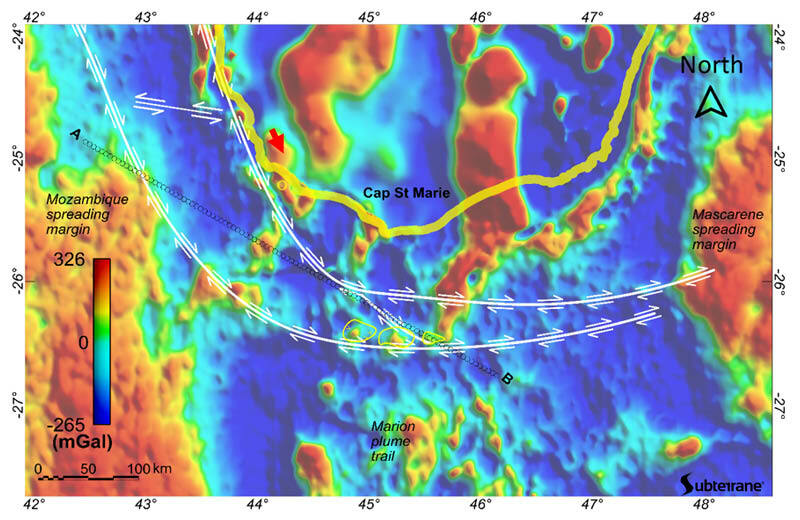 Figure 6: Closure in active strike slip, offshore Madagascar, against the Mascarene spreading margin. (Orange line represents present day coast of Madagascar) Duncan Macgregor, who recently edited a specially themed Plate Tectonics edition of Petroleum Geoscience, kindly shared his African seismic fault compilation. 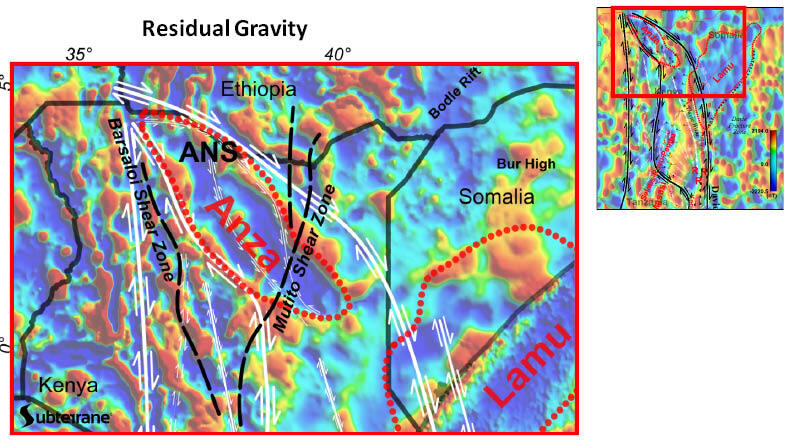 The maps in Figures 7, 8 and 9 shows the influence of the propagating strike slip faults on the evolution of East African basin structure though time. It is possible to identify the fault types by their orientation relative to the individual structural components of the enveloping strike slip fault system. Figure 7: Jurassic faulting (blue) from MacGregor (2017). Davie Transform Margin and intraplate strike slip (red) from Long (2017, 2018). Magnetic chron picks of oceanic spreading (purple) from Seton (2014). Figure 9: Tertiary faulting (yellow), all from MacGregor (2017). Davie Transform Margin (red) from Long (2017, 2018). Green, blue and purple as previously defined. 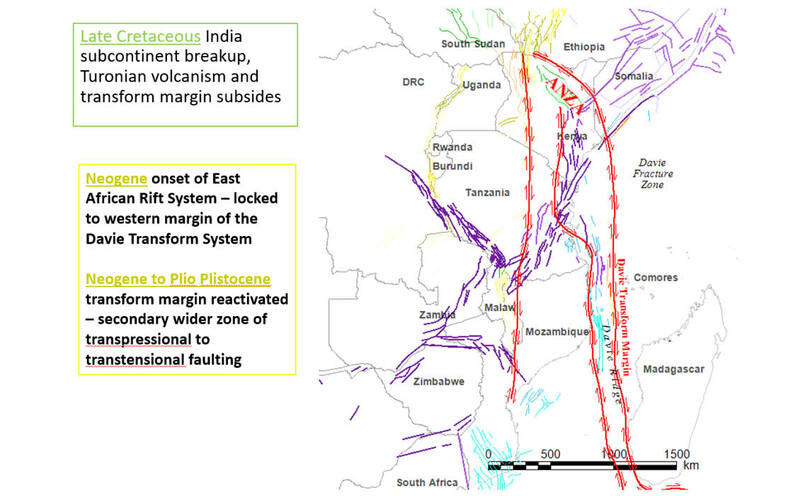 Current research indicates that the entire continent of Africa is defined by a network of long range strike slip fault systems that have propagated through time between the stable cratonic regions (Figure 10). 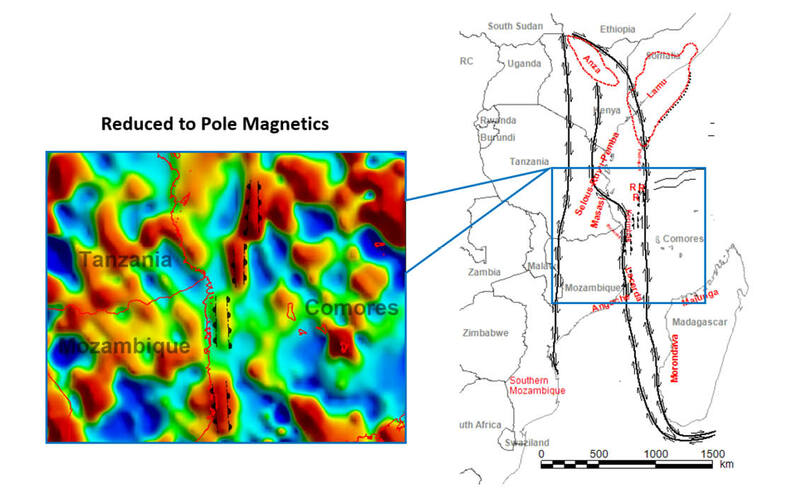 It can now be seen how the west-east Cretaceous rift propagation across Africa is controlled by regional strike slip, and how this system links into the East African strike slip margin. Figure 10: Current research in Africa indicates an extensive system of strike slip faults have evolved and propagated over time, linking western Cameroon volcanic chain to the propagation of the Cretaceous rift sequence across Africa to the Gulf of Aden. (unpublished research). 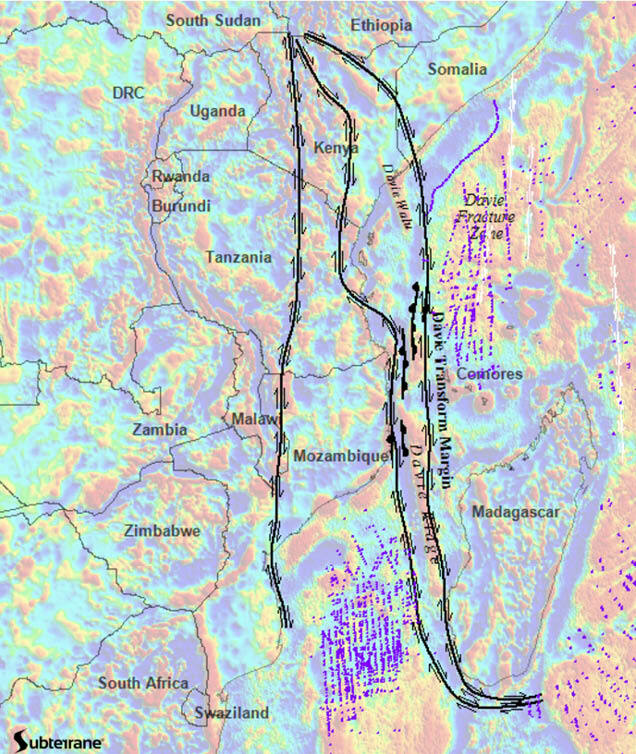 Later Tertiary East African rifting is also seen to be controlled by the bounds of strike slip tectonism and there are also remnants of Karoo strike slip structures in southern Africa. Further afield, the evolution of the Caribbean plate is seen to be controlled by dominant strike slip tectonism, while in the UK and Irish Atlantic Margin and further east, extensional duplexing containing the Rockall and associated volcanism point to another broader regional strike slip system waiting to be unravelled. The Australian and Zealandia continents are seen to comprise a highly deformed sigmoidal structure between spreading Indian and Pacific margins. Indeed there is evidence of the influence of strike slip tectonism on the evolution of the Earth’s petroleum basin systems as far back as the oldest oceanic crust, whilst onshore exposure of ophiolites and relict sutures provide evidence of abandoned strike slip structures and their bounding envelopes. Figure 11: The Bouvet and Marion plume signatures in residual gravity (extract from Long, 2018) We are just beginning to understand how plumes are controlled by deeper shear structure (Figure 11). The work of Reeves, Torsvik (2017), as well as many others in palaeomagnetism and Earth’s geological record will be the constraints used to identify the older influence of strike slip tectonism, and to attempt to find the time when regional strike slip deformation was initiated in the Earth’s history. The presence of Jason and Tuzo (the two large low shear wave velocity anomalies in the lower mantle) perhaps suggests strike slip tectonism was initiated when these structures were once joined in the early stages of the Earth’s evolution, prior to the era of subduction and plate tectonism. Geologist + Owner | Subterrane Ltd.
Andrew is a geologist and owner of Subterrane Ltd., founded in January for the purpose of furthering our understanding of shallow and deep Earth processes in exploration. Andrew will be presenting his next piece in this jigsaw puzzle at Petex, 2018 as a poster. Cordell, L., Y. A. Zorin, and G. R. Keller, 1991. The decompensative gravity anomaly and deep structure of the region of the Rio Grande Rift, J. Geophys. Res., 96(B4), 6557–6568, doi:10.1029/91JB00008.